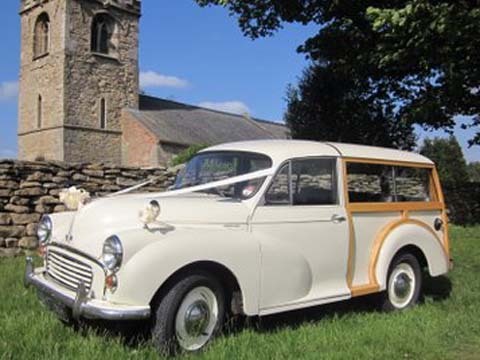 Welcome to "Travel Together" Morris Minor Traveller wedding car hire. We are very proud of the service and of the car we offer to help make your day very special and to give you a lasting memory with this truly iconic car. The car can be decorated in colours of your choosing, for colour matching purposes or the ribbons can have the names of the happy couple with prior notice given. The front passenger seat tips forward for easy access or can be fully removed if required to make access easier. There is a parcel shelf at the back of the car for a flower display. Your chauffeur is smartly dressed in grey suit and matching cap and will offer all support and help throughout. You are welcome to visit and inspect the car before booking. Photograph sessions before and after the service are catered for and every effort is made to manoeuvre the car where needed. We are based in Little Weighton and cover the Hull and Beverly area, prices are based on a 25 mile radius of this area an extra charge will be made over this distance. Starting price is £240 for a 4 hour hire of the car and chauffeur. This price will take into account the number of trips to be made, journey and waiting time, and an additional charge is made exceeding the 4 hours. A non returnable deposit of 50% will be charged on booking and remaining payment will be charged 30 days before the event. Bookings made less than 30 days before the event will be charged in full at the time.